I am clearly a book nerd since this whole thing puts me on edge. First of all, the quote is from "Gone With the Wind" - the movie, not the book I believe. 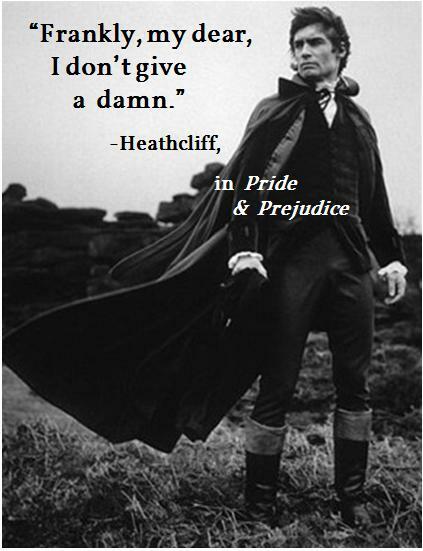 And Heathcliff is not a character in Pride and Prejudice. But other than that, it seems fine. You've tripped off sirens and lots of blinking lights, Melissa. Congratulations. You are our first certified book nerd. Like any man my age, I immediately recognized the quote as one of Yoda's, but I actually had to have the second twist- that the picture was in fact not Dumbledore, but Gandalf- pointed out to me. The multiple layers of funny really tickled my funny bone. I love it. Wasn't he married to Marilyn Monroe for a time?